Businesses dealing with dirty data can get stuck trying to perform even simple BI tasks, such as generate numbers from multiple data sources, when data is not structured correctly for the BI tool to analyze. At that point, businesses come to the frustrating conclusion that while they may have invested in a data analytics or BI tool, business users cannot independently use it to complete the tasks at hand. A preventive measure to solve this BI pain is to find a BI software that can automate the collecting, organizing, and cleaning disparate data. The New York Times reports that data scientists spend from 50 percent to 80 percent of their time collecting and preparing unruly digital data, even before it can be analyzed. This is why data preparation is often referred to as the body of big data’s “iceberg”, while the results people see is only the tip of all the preparation work behind it. A classic example is when a user wants to merge several Excel files into one file in order to run calculations on all the data combined. If the Excel files are not structured in a perfectly compatible way, which is often the case, they will need another tool to prepare the unruly data before it can be uploaded it into the BI tool. If not, an IT department needs to spend hours cleaning and structuring the data before it can even be explored for useful insights. We call this the data preparation nightmare, and it is one of the 5 most common BI problems. Companies who have invested in a BI tools that lack essential functionality on the back-end to prepare data are left with two bleak solutions: Invest in an additional 3rd party tool to clean the data before it is imported it into the BI tool, or ask the IT department to prepare the data, thereby creating a dependency on the IT once again and data wrangling bottleneck. A business intelligence solution that includes a powerful back-end with automatic ETL capabilities to process data sets that need to be restructured and create a single source of truth (in our example, one structured Excel table), as well as a front-end with data visualization capabilities. The front-end part of the tool allows users to visualize data in dashboards, reports, graphs and more. The back-end should be able to do the dirty work by helping users quickly make the data manipulations needed in order for data to be analyzed in the front-end. In fact, some innovative big data analytics software automate the gathering and cleaning of scattered, disparate data. There are BI tools that offer a wide range of capabilities, but in the end are still “partial stack” and therefore don’t deliver both the data joining and preparation needed in the back-end together withdata visualization tools. 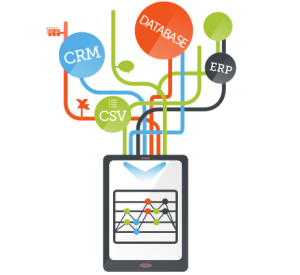 Make sure to choose a full-stack BI software with automated ETL to provide business users with clean and structured data ready to analyze. Tip: A free trial can help you assess if the data preparation is handled automatically. If a free trial is not available, this might be an indication that the average business user will not be able to independently use the BI tool.